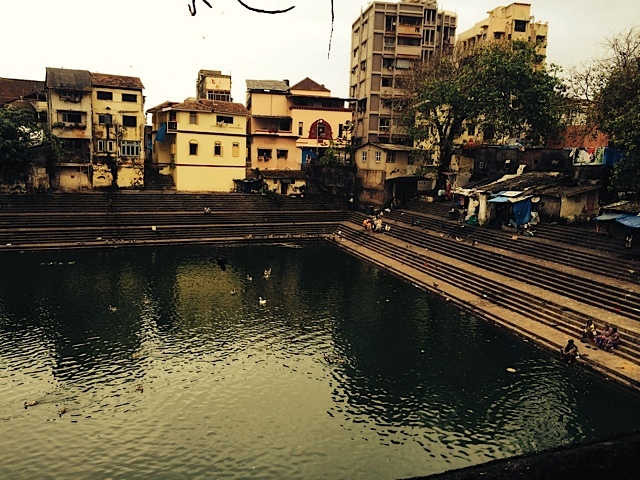 With only three nights in Bombay, I decided to hire a tour guide on Sunday. This is not a city easily navigable for foreigners. Destinations are far flung, transport is daunting, and the flooding downpours are dismal. Further, while many residents speak English, “many” is a relative concept in a city of more than 18 million. I found a bunch of well-reviewed tour companies and chose Hemali Talsania’s Bravo Bombay. She turned out to be an excellent fit. For one thing, she does yoga and was familiar with the Iyengar studios in Lower Parel and in Gamdevi. We drove to a bunch of sights, some which I’d have found hard to approach on my own. While tour groups aren’t my thing, touring with Hemali felt as if I were hanging out with a friend. Among the destinations were three religious sites; I was the only tourist at all of them. People come here when a loved one dies, gathering for multi-day services and perhaps releasing the ashes, if they cannot go to the Ganges. Or they come to touch or immerse themselves in the water for good luck. 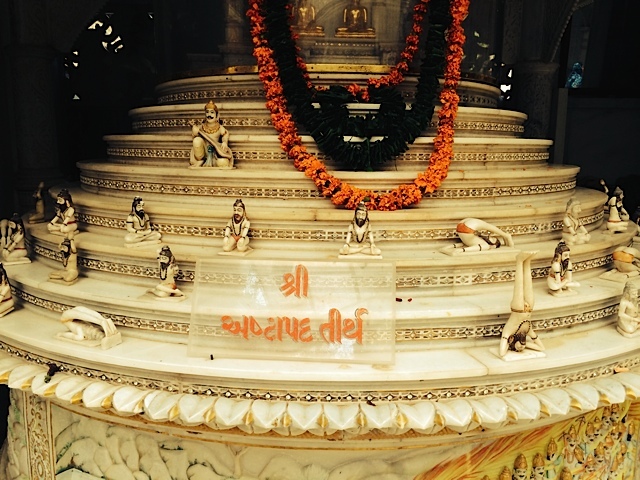 Nearby we stopped at a beautiful Jain temple, carved in stone, in Walkeshwar. Because it was Sunday, worshippers were preparing flowers and incense for rituals. They were laypeople, but for today tied scarves around their noses and mouth as do the renunciates. Check out the figurines of familiar asanas. 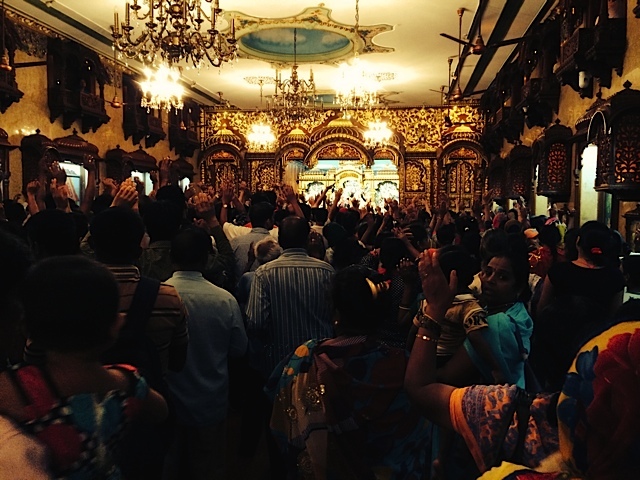 Finally, we joined a lively Sunday service at the Chowpatty branch of ISKCON, the International Society for Krishna Consciousness, i.e., the “Hare Krishnas.” I had no idea that Hare Krishna-ism is so established, run like a business. They apparently attract a lot of followers since they build temples in prime spots and hold large gatherings with free prasada food. On Sunday, the crowd numbered in the hundreds: chanting, clapping, a few men doing full prostrations and women kneeling to touch forehead to floor. 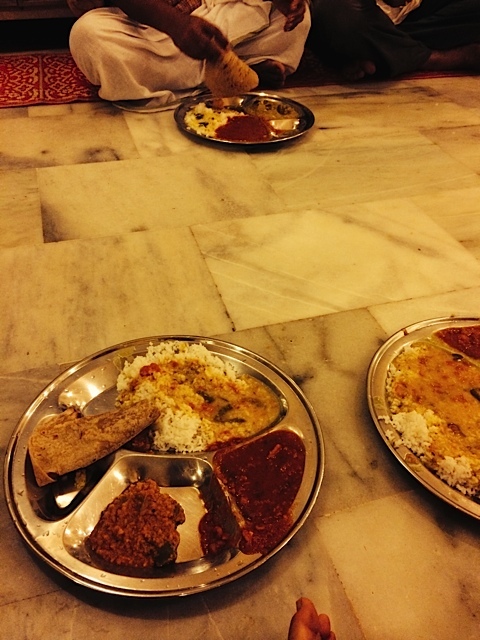 So we washed our hands, got in line, got served rice, dal, two vegetable dishes, and chapati. (Thoughtfully, they even offered me a non-spicy option.) 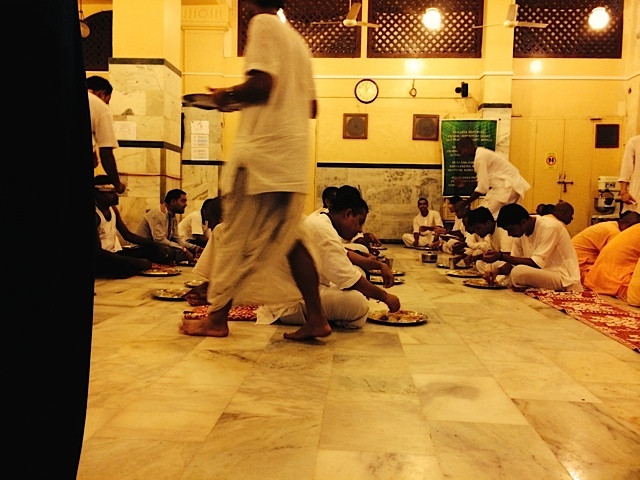 We sat on the floor and I joined the others in scooping the food with the chapati or my bare [right] hand. I must admit that, after a while, my right leg felt a bit cramped, despite my relative ease in Sukhasana. No one else seemed the least bit bothered! The rest of the afternoon, it was pouring and walkways were flooded, with a few puddles too big to leap over. My bare feet in Chaco sandals: drenched with who knows what. 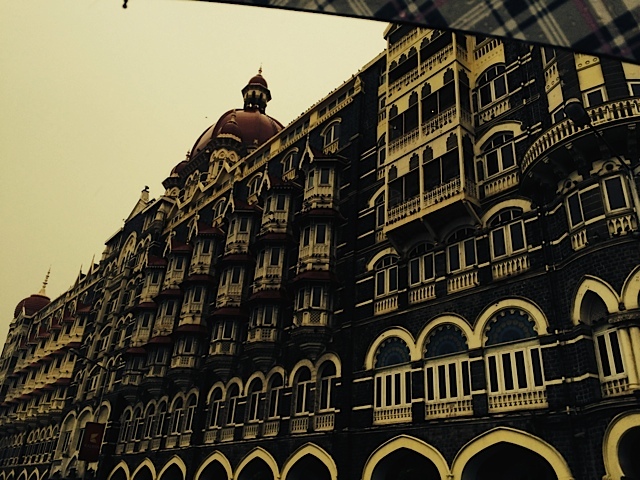 We ended in Colaba, standing under umbrellas at the Gateway of India and then strolling through the Taj Mahal Palace Hotel. Magnificently designed, with gleaming furnishings, luxury retail, and dozens of uniformed staff, it was a surreal otherworld. Here, as I gazed at photos of luminary guests and an elaborate tiffin container, I finally saw other Western tourists. Why am I calling it Bombay and not Mumbai? I’ve been staying with longtime residents of this city; they always refer to Bombay, not to Mumbai, and it rubbed off on me. This is so helpful, Luci. 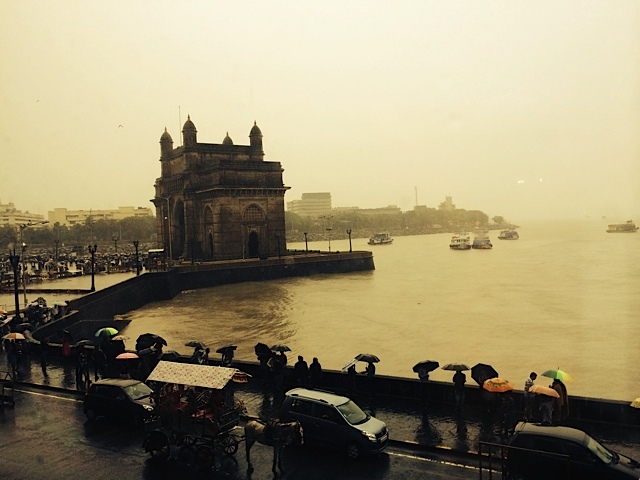 I am heading to Bombay/Mumbia in November, so I might take up your recommendations. I am also looking for accommodation suggestions, so we should chat! I’m loving this, Luci. I hope to read much more. Wonderful description, Luci. Hey, you must be a travel writer! I look forward to reading more. Have fun and be safe. Look forward to more – have a fun and safe trip. Fabulous synopsis of your day Luci. Enjoyed the read a lot and you are a great travel writer! Thank you for sharing details, it makes the virtual travel experience that much richer!